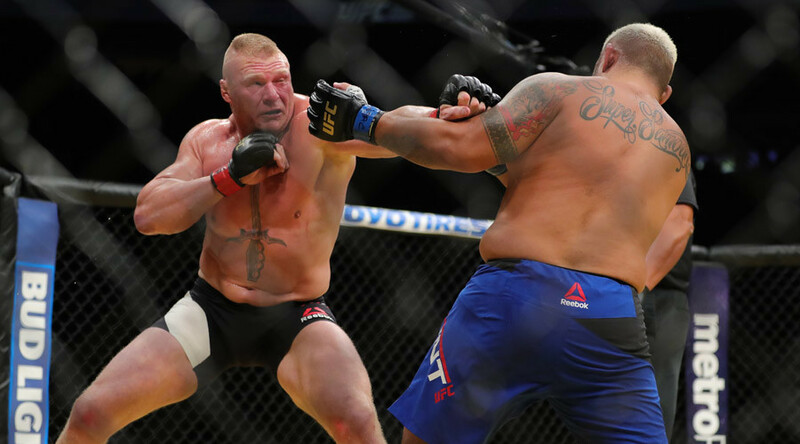 Very happy to see Brock Lesnar get the win over Mark Hunt. The doubters weren’t totally justified in questioning Lesnar’s chances. The guy hadn’t had a fight in years. But he was obviously ready. I don’t know if he regrets re-signing with WWE, but it’s clear his heart is still in MMA. I expect we’ll see him back in the octagon soon. Lesnar will now carry the momentum from this fight into Summerslam, where we now know he’ll wrestle the returning Randy Orton. The announcement of Lesnar’s opponent happened on Smackdown, actually prompting me to watch the show for once. We heard Corey Graves bring up the fact that these two came up together in the WWE developmental system. I expect that will be a large part of the story they tell as we move toward August. I’m a bit concerned about Orton staying healthy in there with Brock. He’s just come off shoulder surgery, after all. But then again, I had those same concerns about The Undertaker, and as far as I know he came out of it fine. WWE is going to need as many stars as they can fine once this brand split starts. Make no mistake about it, Randy Orton is one of their biggest commodities. Darren Young wins a battle royal to earn an Intercontinental Title Match at Battleground. The obvious choice to win this match seemed to be Apollo Crews, for no other reason than he was the only participant to get a TV entrance, and they played his music through Miz’s pre-match promo. But Darren Young was a pleasant surprise. And they were chanting his name! Imagine that. However, I’m curious about the way he won. Crews and Baron Corbin eliminated themselves. Young won by accident. So what does that say about him going into Battleground? Either way, any excuse to get Bob Backlund on live TV works for me. I’ve come to enjoy Miz’s commentary. He does a nice job putting other talents over. He seemed to be getting instructions to put Corbin over. That’s fair enough. I suspect Corbin will receive much more attention once the brand split takes effect. He still comes off really green. But the best solution for that is experience. Sheamus def. Zack Ryder. I was blown away when I saw Ryder get a clean win over Sheamus on Smackdown. That, combined with his win last week on Raw, leads one to a stunning conclusion: Zack Ryder is getting a push. Four years after he took the wrestling world by storm with his YouTube show, WWE finally seems to be taking him seriously. I’m really proud that he’s persevered after all this time. The only wrestling t-shirt I’ve purchased in the last decade was Ryder’s Broski v-neck. That’s how much of a fan I was, and still am. A United States Title Match with Rusev seems imminent. Will he win? Probably not. But at least he’s in the conversation. Tyler Breeze & Fandango def. The Lucha Dragons. During this match the announcers brought up the idea that tag teams could be split up during the draft. I’m hoping that doesn’t happen very much. Remember when they split the Dudleys up in 2002 for no real reason? And then they put them back together a matter of months later? Yeah, let’s not do that again. Seth Rollins airs mock interview with Roman Reigns using old interview footage. Dean Ambrose comes out to confront him. A WWE Title Match is made for next week’s Raw. Kurt Angle did something like this to The Rock at the tail end of the Attitude Era. It’s an okay little gag. No harm done, even though they are talking about a legitimate drug test violation. Seth Rollins came off like a million bucks in this segment. 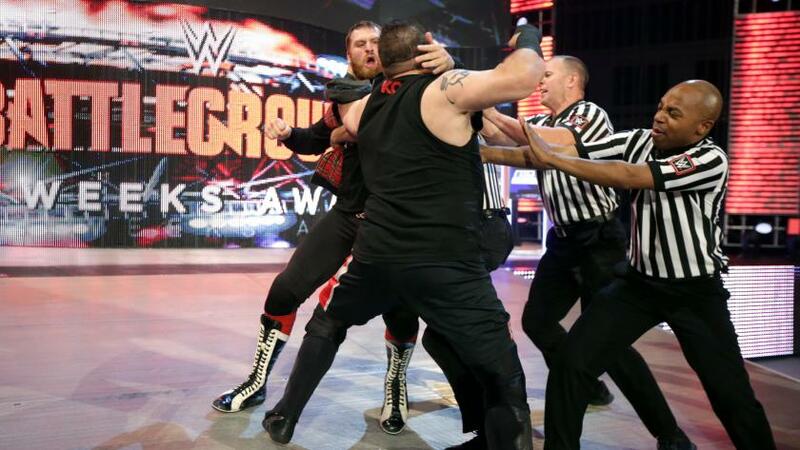 He said that Reigns should be taken out of the title match at Battleground, and the fans cheered. He talked about Ambrose sneaking up on him and taking the belt, which did happen. He was also right that Ambrose couldn’t beat him for the belt last year. Rollins has a legitimate argument to being the uncrowned WWE Champion, and being better than both Ambrose and Reigns. In Ambrose’s response, however, he came off more threatening than he has in weeks. Jokey Dean Ambrose is fine sometimes. But as the champion, we need to see more of the crazy and dangerous Dean Ambrose. When he’s on, Ambrose is as good as anybody in the company. Rollins, to his credit, played off of that intensity very well. He looked intimidated, as his character should be. As for next week’s title match, I don’t expect the belt to change hands. Battleground, however, is a different story. Kevin Owen gets Sami Zayn ejected from the commentary table before his victory over Cesaro. Zayn attacks Owens afterward. I wish they’d just make this some kind of stipulation match that allows Zayn and Owens to fight all over the arena. I just wish they’d stop doing that lock-up/punches thing they do. It takes me right out of whatever scene they’re in. The New Day journey to the Wyatt Family “compound.” So…was this WWE’s attempt to outdo the “Final Deletion” that TNA did on Impact last week? If so, they failed. Let’s go ahead and talk about the Final Deletion. It was a match Matt and Jeff Hardy shot on location, which served as the blow-off for the bizarre program they’ve had in TNA this year. Produced by Jeremy Borash, it was a truly ridiculous spectacle. There was a weird vignette with drones and a hologram, spots with fireworks, and the lunacy fans have come to expect from Matt’s crazy character. It was far from your traditional main event, but that was the point. A lot of fans enjoyed it, and it got TNA some much-needed positive buzz. All I can say about this, is that it’s good to see people talking about TNA again. What that brand desperately needs is some buzz, and they got it. Fast-forward six days, and we get this. It looked like WWE’s take on a found footage flick, a la The Blair Witch Project or Cloverfield. But the shaky camera was just awful. There were traces of the Final Deletion. We had the music, the stuff in the water, Bray using an axe, the car crash, etc. The ironic thing is, had they shot this in a more traditional manner, it would have been a lot more interesting. We’d have been able to follow the action more closely. Also, that didn’t look much like a compound to me. More like an open field. On the plus side, the image of Braun Strowman rising from the water and roaring was awesome. Literally the best thing he’s ever done. And that final image of the lanterns in the forest was cool. But all in all, this was very derivative. WWE drawing inspiration from something TNA did? In 2016? Who’d have thought? Enzo & Cass def. Luke Gallows & Karl Anderson via disqualification. John Cena makes the save afterward. Of course Cena was there. C’mon, now. Decent match. I’ve got high hopes the match at Battleground will be one of the better six-man bouts we’ve seen on pay per view in recent years. I doubt it’ll top The Shield vs. The Wyatt Family. But you never know. This all obviously leads to another match between AJ Styles and John Cena at Summerslam, and possibly a tag title shot for Enzo & Cass. Sasha Banks def. Dana Brooke. I was really curious to see how Banks and Brooke would match up. All things considered, they did pretty well. Absolutely the best match I’ve seen from Dana Brooke since she got called up. They also gave this match a good amount of time, which I credit them for. We wanted Sasha, and they gave us Sasha. They took their damn time, but better late than never. 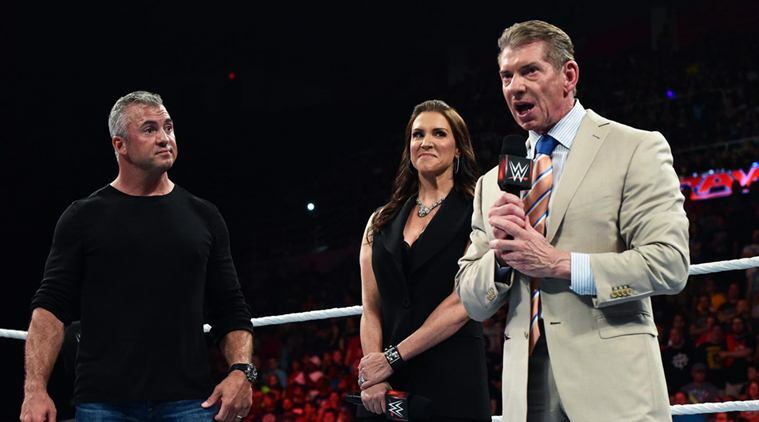 Vince McMahon names Shane McMahon Commissioner of Smackdown, Stephanie McMahon named Commissioner of Raw. General Managers to be named next week. First off, Vince’s impression of “sweet” Stephanie was awesome. The funniest thing on this show in weeks. What happened here isn’t surprising. This looked like where they were going. The heel Stephanie on one show, the babyface Shane on the other. The General Manager thing is a bit odd. Traditionally, you have one authority figure that makes matches, stipulations, etc. So does the GM now fill that role, with Shane or Steph coming in as necessary? It all seems redundant. But maybe it’ll make sense when we see it in action. By the way, isn’t Kurt Angle available these days? I do, however, think Vince gave us a clue about how things are really going to go once this split takes effect. He made a point to call Raw the “three-hour flagship” of WWE. In the end, Raw is like Vince’s favorite child. Even with the added emphasis on Smackdown, eventually it all comes back to Raw. Image 1 from rt.com. Image 5 from denofgeek.com. Remaining images courtesy of WWE. This entry was posted in Wrestling and tagged AJ Styles, Apollo Crews, Baron Corbin, Big Cass, Braun Strowman, Bray Wyatt, Brock Lesnar, Brock Lesnar UFC, Brock Lesnar vs. Mark Hunt, Brock Lesnar vs. Randy Orton, Dana Brooke, Darren Young, Dean Ambrose, Enzo & Cass, Enzo Amore, Fandango, Impact Wrestling, Jeff Hardy, John Cena, John Cena vs. AJ Styles, Karl Anderson, Kevin Owens, Luke Gallows, Matt Hardy, pro wrestling, professional wrestling, Randy Orton, Randy Orton return, Roman Reigns, Sami Zayn, Sasha Banks, Seth Rollins, Shane McMahon, Sheamus, Stephanie McMahon, The Lucha Dragons, The Miz, The New Day, The Wyatt Family, TNA Final Deletion, TNA Wrestling, TNA Wrestling Pop TV, Tyler Breeze, UFC 200, Vince McMahon, WWE, WWE Monday Night Raw, WWE Raw, WWE Raw results, Zack Ryder on 07/12/2016 by primaryignition.